To visually demonstrate the U.S. Tennis Association's commitment to Hawaii, the USTA spent $10,000 to convert the Diamond Head Tennis Center's center court into a replica of a US Open Court. Keith Hashimoto, left, and Shane Oliberos put up the US Open logo yesterday as Dennis Lajola looked on. Lajola is ranked 30th in the International Tennis Federation Junior World standings. 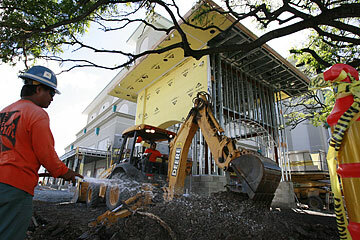 Construction crews are working to complete a 194,000-square-foot Public Storage facility and retail shops on the corner of Kapiolani Boulevard and Kamakee Street by May 25. Flor Carino hosed down the dust yesterday afternoon as Tony Sooto used a backhoe to clear out debris.